Like its close chemical relative, nitrogen, phosphorus is a nonmetallic element with a seemingly contradictory nature. Found in fundamental organic compounds such as DNA, ATP, and phospholipids, phosphorus is essential to life, yet it is also a component of dangerous explosives and some of the most potent poisons known, organophosphate nerve agents. However, upon closer consideration, these two sides of phosphorus are in fact inextricably connected: phosphorus would be incapable of playing its myriad biochemical roles without the very chemical properties that make it so reactive in isolation, while the lethal effects of nerve agents requires their structural similarity to the natural target of an enzyme which they irreversibly inhibit. The complex chemistry of phosphorus lends it to these roles and many others, making it an element that defies simple characterizations. Despite its ubiquity, phosphorus was not known as an element for most of human history, as it is too reactive to be found naturally outside of compounds. Elemental phosphorus was first isolated by Hennig Brand in 1669. Brand was an alchemist who was experimenting with urine in an attempt to produce the philosopher’s stone, and instead produced a mysterious waxy white substance that glowed in the dark--a phenomenon now known to result from a slow light-producing reaction with oxygen. Brand showed his discovery to a number of others, and eventually sold his methods to D Krafft, who proceeded to exhibit the substance around Europe. The secret that the substance was produced from urine was soon leaked, leading to the production of the element by many other chemists. Matches were the first commercial use for phosphorus, but the early match industry was fraught with problems. White phosphorus, the form isolated by Brand, was both extremely unstable and toxic, and early matches caused accidental fires and poisonings of the workers who produced them. However, in 1850, Anton Schrotter von Kristelli showed that through controlled heating, white phosphorus could be transformed into a red substance that was more stable and that did not produce toxic phosphorus fumes. Today it is known that elemental phosphorus can additionally be induced to form even more stable violet and black crystalline forms through the application of temperature or pressure, though the red and white forms remain the most used. The use of red phosphorus, as well as various safety-enhancing design elements, such as the separation of reactive elements on match heads and a special striking surface in “safety matches”, allowed for the widespread use and production of considerably safer phosphorus matches. In 1769, Johan Gottlieb Gahn and Carl Wilhelm Scheele showed that bones contained calcium phosphate, and that the pure element could be extracted from bone ash. Bone remained the major source of the element for the next seventy years. In the 1840s, it was recognized that bat and bird guano was another important source of phosphates, particularly for use in fertilizer. As early as 1850, phosphate rock was also used for a phosphorus source, but this method of production was very significant until after the development of electric arc furnace in 1890, which made the process significantly more feasible. Industrial extraction of phosphorus from phosphate rock did not begin to approach the scale of today’s phosphorus industry until the World Wars, during which white phosphorus was used widely in weapons. Phosphorus is used in many incendiary devices, such as incendiary bombs and molotov cocktails, as well as in smoke screens. Phosphorus burns vigorously, producing fires that are difficult to extinguish and horrific wounds when it contacts human skin. Interestingly, its use is still allowed for bombs and smoke-producing munitions, but it is classified as a chemical agent when used in direct bombardment, and therefore this use is prohibited. The organophosphates developed for warfare are also considered illegal chemical weapons, though many countries still retain stockpiles of these compounds, which include VX and sarin gas. However, organophosphate pesticides, which operate through the exact same mechanism as these chemical weapons--the inhibition of acetylcholinesterase, which is necessary for normal nerve function-- and can be lethal in small doses when inhaled, ingested, or even absorbed through the skin, remain common tools in commercial agriculture. The potency of these compounds, as well as their extremely quick action in the body and their wide availability make them one of the most common causes of poisonings worldwide, and they are often implicated in suicides in rural areas. The use of phosphates in fertilizer, while less immediately toxic, is another aspect of modern agriculture with sometimes troubling side-effects. Phosphorus is often a limiting nutrient in marine ecosystems, and phosphate-rich runoff from over-fertilized fields is therefore often the cause of overgrowth, which manifests as algal blooms. At minimum, a sudden growth of algae, followed by its die-off and decay, consumes dissolved oxygen in the water, producing hypoxic conditions that kill off animals and plants in large numbers. In particularly concerning cases, the species of algae in the bloom are themselves dangerous, producing neurotoxins that kill marine life directly and also accumulate in seafood, leading to poisonings. Despite these problems, fertilizer remains the largest use of industrially produced phosphorus. The use of phosphates as chelating water softening agents, often to increase the effectiveness of detergents, is also known to contribute to harmful effects of phosphate on the environment. Beyond fertilizers, poisons, and water-softening agents, there are a number of other phosphate compounds with important applications. Various inorganic phosphates are used as food additives, often as leavening agents. Trisodium phosphate is widely used in cleaning agents and disinfectants, and sometimes as a flux in ceramic glazes or solder. Zinc dithiophoshate is a common anti-wear additive used in automotive lubricants such as motor oil. Tricresyl and tributyl phosphates are important plasticizers, used to produce nitrocellulose, acyrlates, and PVC, and also serve as solvents in inks, resins, and adhesives. Glyophosphate, known commercially as Roundup, is an widely-used systemic herbicides. Other important organophosphorus compounds include organic derivatives of phosphine, the phosphorus analogue of ammonia, which itself is used to produce many specialty phosphate chemicals and as pesticides and fumigants. Phosphorus has a number of other commercial uses. In addition to being used to produce fertilizers and various industrial phosphates, phosphoric acid may be used for rust removal as an etching agent in dentistry, or for the production of phosphoric acid fuel cells. Phosphazenes are nitrogen-phosphorus compounds used to produce hybrid organic-inorganic polymers that can be engineered to have highly desirable properties. These polymers have been used to produce drug-delivering gels that degrade in the body, polymer electrolytes with potential for use in fuel cells and batteries, and elastomers that can withstand a variety of chemical and thermal environments, which frequently find use in aerospace components. Pure phosphorus is also used directly in metallurgy to make phosphor bronze, and sometimes finds use as a dopant to manipulate the electrical properties of semiconductors. Phosphorus (atomic symbol: P, atomic number: 15) is a Block P, Group 15, Period 3 element. The number of electrons in each of Phosphorus's shells is 2, 8, 5 and its electronic configuration is [Ne] 3s2 3p3. The phosphorus atom has a radius of 110.5.pm and its Van der Waals radius is 180.pm. Phosphorus is a highly-reactive non-metallic element (sometimes considered a metalloid) with two primary allotropes, white phosphorus and red phosphorus. Compound forms of phosphorus include phosphates and phosphides. Phosphorous was first recognized as an element by Hennig Brand in 1669; its name (phosphorus mirabilis, or "bearer of light") was inspired from the brilliant glow emitted by its distillation. Although white phosphorus is very toxic, red phosphorus is not considered toxic. Safety data for phosphorus and its compounds can vary widely depending on the form. For potential hazard information, toxicity, and road, sea and air transportation limitations, such as DOT Hazard Class, DOT Number, EU Number, NFPA Health rating and RTECS Class, please see the specific material or compound referenced in the Products tab. The below information applies to elemental Phosphorus. 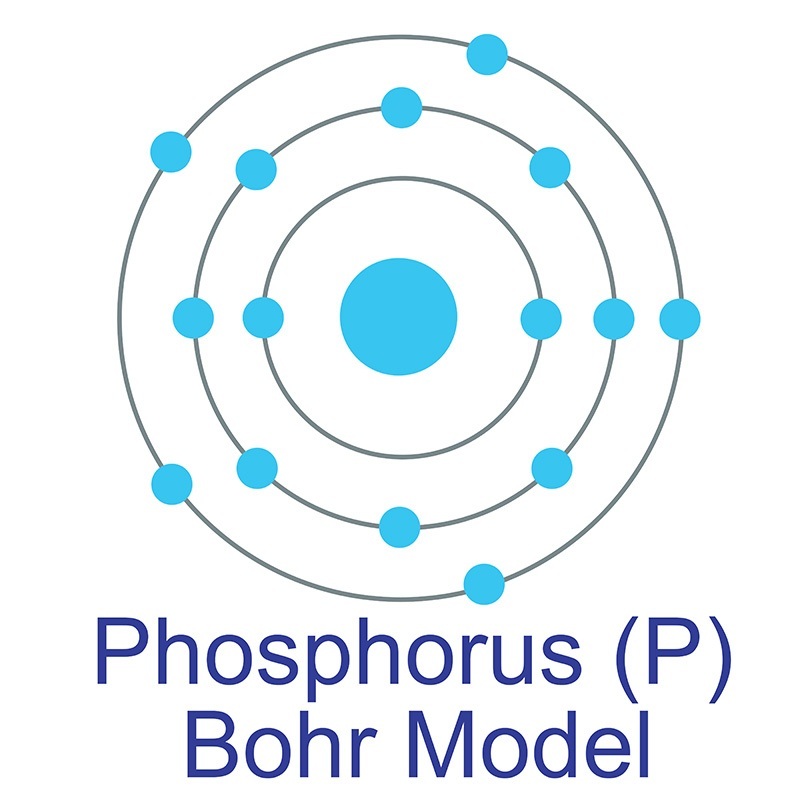 Phosphorus has one stable isotope: 31P.